Basement Waterproofing Peoria, IL | Kelley Construction Contractors, Inc.
Leaky basement? Standing water on the floor? It’s time to call Kelley Construction Contractors, Inc. and learn about our wet basement solutions. It’s never too early to invest in a basement waterproofing system if your property doesn’t already have one. Taking preventative measures to protect your property will save you both the time and the stress of a flooded basement. Our expert team can help you find the solution that’s right for you, from excavating the exterior of your basement, to interior dewatering systems. When you choose Kelley Construction Contractors, Inc., your days of dealing with a wet basement are over! Do I need basement waterproofing? Let our basement waterproofing contractors help keep your property dry! If you notice any of these signs of a wet basement, contact Kelley Construction Contractors, Inc. immediately. Our waterproofing contractors will come to your property for a professional inspection and recommend the best wet basement solutions. 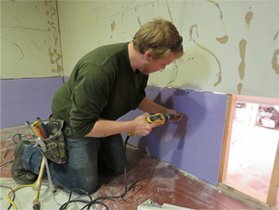 What wet basement solutions do you offer? Call today for your free estimate, and uncover the solution that’s right for you!